Zombies! Forget sparkly vampires, zombies are what’s hot in the paranormal scheme of things, and it looks like they’re here to stay (who else is stoked for the next Resident Evil movie?). Dromedary LLC’s game app, Zombie Defense, is a way for you to gauge just how long you’d survive in a zombie infestation with not much more than guns and your brain. Who’s up for some target practice? You control a band of four gritty Texans: Toby, Candi, Zed, and Oma, each with their own strengths and weaknesses. At the beginning of the game, you outfit them with whatever weapons are on hand. The default gun they can all carry is a .22 pistol, and you get one 9mm Glock 17, which you can drag from the list to the survivor to arm. Choose carefully about who gets what weapon. Then choose the location of where you’ll make your stand for the night. 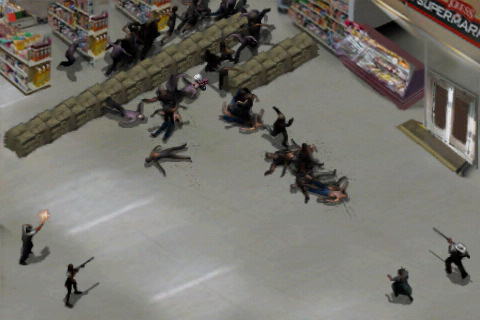 Once you have a location, you must set up barricades, bombs, and move the four survivors to an optimal position for repelling zombie attacks by tapping and dragging them around. Location choice is also not easy, because if you stay in the same place for more than one night, more zombies will be attracted to that area. But staying means you get to reuse all the defenses already set up in that area, in addition to prior knowledge of how the zombies will move in. If you manage to survive the night, you will be able to use the daylight to either scavenge for more weapons or to improve defensive positions–yet another choice to be made that will affect your survival. Come nightfall, the carnage begins again. Zombie Defense is constant game of choose-your-own-adventure–most, if not all, of the choices you make will determine the outcome of the night. People who love strategy and bloodshed would probably get a kick out of this game. It boasts eerie, atmospheric music and fantastic graphics…just watching the Horde blitzkrieg your Texans is amazingly fun and kind of horrifying at the same time. Clearly, Zombie Defense was developed with a sense of humor, a slick eye for detail, and a good feel for gaming. You won’t be disappointed with the gameplay, but note that this is the Lite version of Zombie Defense, which will give you full gameplay of the first three nights; the in-app purchase of $0.99 will give you access to 20 nights of “increasingly spectacular zombie mayhem.” If you can make it that far. AppSafari review of Zombie Defense was written by Julie Guan on June 24th, 2010 and categorized under Action, Adventure, App Store, Free, Fun, Games, Strategy. Page viewed 6866 times, 2 so far today. Need help on using these apps? Please read the Help Page.